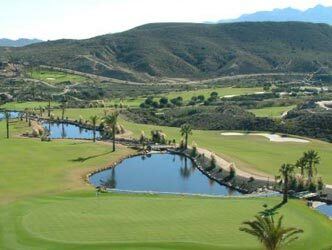 If you are looking for a golf course in Almeria, you definitely have to visit Valle del Este Golf Resort. Designed by José Canales in 2003, respecting the natural pre desert setting where it lies, Valle del Este Golf maintains the layout of the original farm and the natural landscape, highlighting the contrast between the green fairways and golf course with the exclusive surrounding landscape. Each hole presents a unique design that makes each golf round a different challenge. Our driving range measures over 300 meters deep, with mats and ball machines for your practice, three putting greens and a wide approach area. The Hotel Valle del Este is located in the heart of the golf course, allowing you to enjoy the game of golf just a few meters away from your room. The Clubhouse located inside the Hotel is perfect for players who stay with us. It is the meeting point for golfers where information about activities and competitions taking place in Valle del Este Golf is provided daily. We also have a Golf Shop where you can find the best golf brands and apparel. At the Valle del Este Golf School there are various teaching programs available, covering all your needs from lessons for children to advanced golfers, all carried out by the golf pro Martin D Archivio, director of the Golf School. So if you are thinking of a pleasant golf experience, think about our golf course in Almeria Valle del Este Golf Resort and you will not be disappointed.